Brand comparisons are our thing for this year and we plan on carrying on exploring many other brands and learning more about their stories, their products and, best of all, comparing them to each other to see which one would be the better choice. Today we will be going through two very popular brands, especially in North America, as they are a staple in the wardrobe of many who love spending a good deal of their time out in nature. 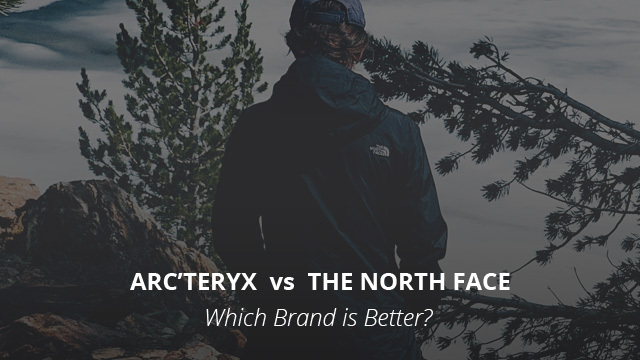 We are talking about Arc’teryx and The North Face. They come with great reviews, great products and high prices, that’s why we will be comparing them to each other to see how they measure up and which one you should go for. Let’s get right down to business! Established in 1991 in North Vancouver, British Columbia, Arc’teryx is one of the most suggested brands online when it comes to technical garments. The brand was founded by Dave Lane and its distinct name is in referral to one of the earliest known birds, the Archaeopteryx. Well, the bird is proof of evolution and the brand’s philosophy is based on evolution’s constant change and adaptation. Arc’teryx exhibits those same qualities in their high quality products and innovative designs that are quite hard to rival, if we are being honest. Originally the brand started out with gear for climbing, with two of its most popular products being the Vapor harness and the Bora backpack, which we have mentioned before. Both of these products were made using thermolamination technology. When it comes to technical wear, Arc’teryx can attribute most of its success to its collaboration with the Gore-Tex fabric, which really helped the brand expand its product range and also increase in popularity. Being a brand renowned for high quality garments means that the materials used are also of the same high standard. The raw materials used by Arc’teryx are not just high quality, but also Bluesign® Certified, which is a standard that is made only by fabrics and materials free of harmful chemicals to the human body and environment. Ethical sourcing and sustainability are two other important matters that this brand takes very seriously. Arc’teryx guarantees that the working conditions on all of its facilities are up to standard and its workers are treated fairly. Its products are also traceable and humanely and sustainably sourced in order to minimize environmental impact. Another consideration is the durability of their products, which are made to last for many years. This is not just a great selling point, but it also lowers the environmental damage of having to re-manufacture products. 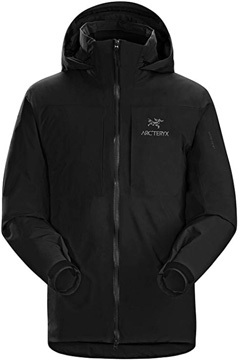 In regards to technologies, Arc’teryx has developed its very own technology, the AC2 technology, which is mainly used in their backpacks, whereas for its garments, as mentioned previously, the Gore-Tex fabric is used. As we usually do, we have picked two designs for today’s selection. The first is the Fission Sv jacket for men. This is a Gore-Tex jacket, which is both windproof and waterproof, while also being highly breathable. This design is suitable for a number of outdoor activities and it comes with a hood, drop-tail hem and adjustable sleeve cuffs. For women, we picked the Darrah coat, an elegant design that is made for fall and early winter. It is a Nylon jacket, insulated with Polyester and its body is made of 87% polyester and 13% Cotton. It has a drop-tail hem and full-length central zipper, as well as a hooded collar. This is an insulated jacket, which is also wind and water-resistant, suitable for unstable weather and breathable enough for a variety of activities. Arc’teryx comes with a varying price range, which features both buyer-friendly prices, as well as some that seem ridiculously high. The brand’s average jacket costs around $200-$300, but certain designs can go as high as $750 and above. In all honestly, they absolutely are. They are very well-made both in design and performance and the life cycle is commendable, which in our opinion more than justifies the prices. If you would like to learn a bit more as to why the brand has such high prices, you can find further information in our recent piece on this topic. Probably one of the most frequently featured brands on our selections and reviews, The North Face was founded in 1966 in San Francisco, California, in the United States. Similar to some other brands we have looked at in the past, including Arc’teryx, The North Face started out as a brand that manufactured climbing and backpacking gear. From there it grew into the brand it is today, with its numerous products and its high quality and reputation for great garments. While the brand still manufactures and sells some great technical pieces, they have also featured many fashionable designs, slightly focusing more on clothing that can be worn as apparel and for more casual wear rather than just focusing on high-performance garments. Being a brand that takes environmental issues seriously, The North Face strives to make use of recycled materials for their products. Most of the polyester used is sourced through recycling and its other natural and raw materials are sourced sustainably and ethically, per the required standards. Another great step in lessening the environmental impact is the use of PFC-free water repellent treatments in their garments. These products are less harsh on nature and do not cause the damage that PFC-based products do. The use of Gore-Tex fabrics is common in many name brands that specialize in technical garments, and it can be found in some of the brand’s designs. However, The North Face is one of the brands with the highest number of technologies developed by themselves and these include several high-performing fabrics and insulations. Bear mentioning DryVent, WindWall and FlashDry, which are some of the fabrics used in the brand’s jackets and other products. However, arguably their most popular development is the ThermoBall insulation, which is done in partnership with PrimaLoft®. This insulation mimics down not just in performance but also in its shape. You can find out more about PrimaLoft and ThermoBall from our previous articles where we compared the two to Down insulation. 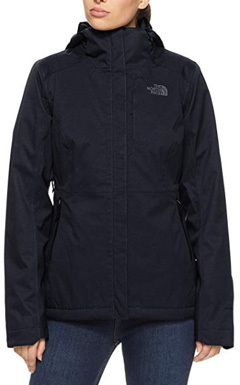 In regards to manufacturing, The North Face products are always commended online for being well-made and long lasting. Lastly, another great feature of the brand that bears mentioning is its lifetime guarantee that covers most problems that could arise. 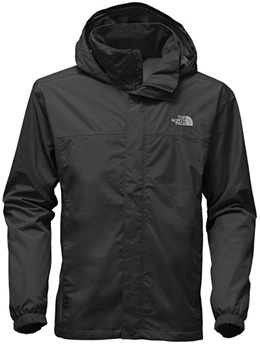 The first design we have chosen by The North Face is the Resolve 2 jacket for men. This is a 100% Nylon jacket that is weatherproof and designed for challenging conditions and a number of outdoor activities. Its attached hood stows under the collar and it also comes with elasticized sleeve cuffs. The design we chose for women is the Inlux 2.0 insulated jacket, which is made of DryVent fabric, thus it is waterproof and breathable. 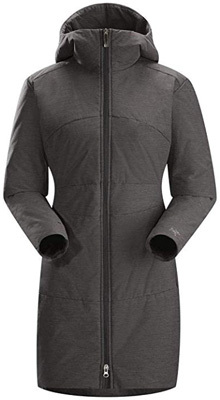 It comes with an adjustable hood and Heatseeker insulation that makes it a great choice for early winter. This design also comes with pit vents for added breathability and a drop-tail hem for better coverage. The North Face is by no means a cheap brand and its average products cost around $200. We won’t beat around the bush here, they are worth the price. They are high quality and perform as advertised and as expected by such a brand. If you are curious to understand some of the reasons as to why their jackets are so expensive, head on here. While in our most recent brand comparisons we sided with Arc’teryx due to its overall quality of products and their performance, today it’s a bit more complicated. Both brands are of high reputation and for good reason. Which one is better? They both are. However, there are slight differences we should mention. The North Face provides a wider product range that cover not just sportive wear but also clothes that are more casual and less sports-like in their appearance. This might be more appealing to those looking for a seasonal jacket that will help keep you reasonably protected against the elements. Their technical pieces don’t fall behind either, but in regards to jackets that are meant for performance, it’s really difficult to outdo Arc’teryx. Therefore, if you are looking for a technical jacket that will last long, perform effortlessly, fit well and keep up with you, Arc’teryx is the brand to go for, in our opinion.